Phoenix Suns guard Devin Booker, right, drives the lane past Denver Nuggets center Nikola Jokic during the second half Friday in Denver. 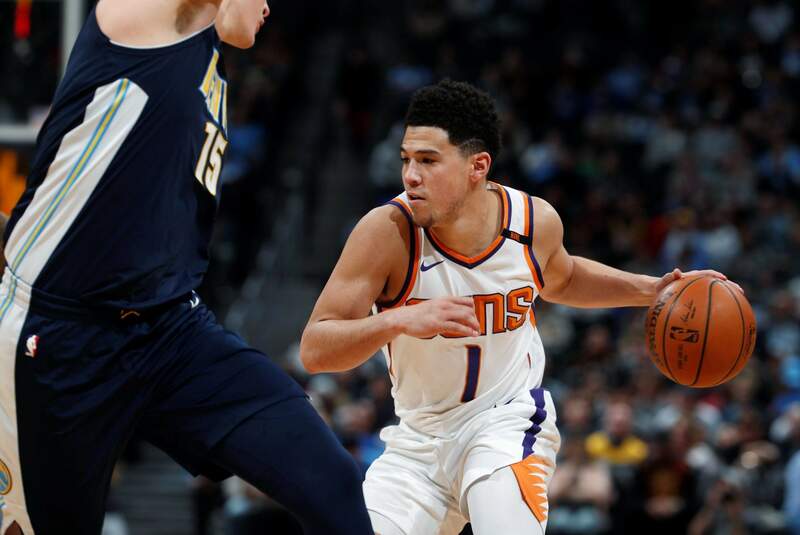 DENVER – Devin Booker scored 30 points, T.J. Warren had 25 and the Phoenix Suns defeated the Denver Nuggets 108-100 on Friday night. Josh Jackson and Isaiah Canaan added 16 points apiece off the bench for Phoenix, which snapped a seven-game losing streak to the Nuggets. The Suns benefited from an earlier arrival than their last game in Denver. Mechanical issues delayed their flight for the Jan. 3 game until five hours before the opening tip, and the Nuggets raced to a 134-111 win. The extra night in Denver helped Phoenix to its first win against the Nuggets since Nov. 20, 2015. Jamal Murray scored 30 in his return to the lineup and Nikola Jokic had 14 points and 17 rebounds for Denver. Murray missed Wednesday’s game at the Los Angeles Clippers with concussion symptoms. He was evaluated by doctors before the game and cleared to play. The Suns grabbed the lead with a 17-3 run to start the second quarter and never trailed again. They led by as many as 15 in the first half, but Murray scored seven straight points to start the third quarter to get Denver within 62-59. Phoenix scored the next 11 points to push the lead to 14. Denver made it 101-97 on a 3-pointer by Jokic and runner by Gary Harris with 3:57 left, but the Nuggets missed their last six shots and the Suns pulled away. Harris finished with 16 points and Trey Lyles had 15 points and seven rebounds in his second start of the season. TIP-INSSuns: F Marquese Chriss missed his fourth straight game with a hip injury. Interim coach Jay Triano said Chriss might undergo further testing. “I know that he is concerned,” Triano said. “I’m sure he will do what he wants to do.” ... The Suns won on the road for the first time in 2018. Nuggets: G Monte Morris was brought up from the G League but did not dress once Murray cleared the concussion protocol and was able to play. ... Several Colorado Rockies players were on hand during the team’s winter caravan. Manager Bud Black, Charlie Blackmon, Chris Rusin and Tony Wolters sat courtside. Denver Broncos linebacker Von Miller also was courtside. UP NEXTSuns: At the Milwaukee Bucks on Monday night. Nuggets: Host the Portland Trail Blazers on Monday night.